The north west coast of Koh Mak offers accommdation in a combination of boutique resorts and a small boutique hotel, a couple of bungalow resorts, large family villas, a guesthouse and even some camping. The resorts are located on the two beaches, Ao Suan Yai Beach and Ao Pra Beach, the cape separating them and also along the central hill above. Ao Suan Yai has a lovely stretch of beach with two boutique resorts, Koh Mak Resort and its sister, Seavana Beach Resort, stretching from the central wooden pier all the way down the sand to the southern end. Seavana Resort, one of Koh Mak’s very best resorts, offers 4 types of room with their deluxe seaview starting at 3,000bt, their seafront suite at 5,500bt per night. Koh Mak Resort, next door, has bungalows from 1,800bt, through 3,500bt for standard beachfront and up to 6,900bt for its deluxe family suite. Heading the other way, Pompak Dee Bungalows offers a handful of a/c rooms at 2,500bt for a double, with same owners also operating Golden Beach Camping next door at 200bt for one night. Further north from them, Happy Days, has its own selection of larger a/c bungalows, all uniquely constructed from coconut tree wood, again around 2,500bt a night. Carrying on down the sand, the beach remains undeveloped, great for a peaceful walk as the sun sets or also to seek out that track to the remote and untouched Turtle Beach in the far north. Simply follow the links below to find more detailed listings. At the southern end, recently split apart from Koh Mak Resort and completely modernized and rebuilt, 22 sea facing rooms, mixture of suites, jacuzzi deluxe and superior rooms. Restaurant, swimming pool, kayaks, bicycle hire. Great location and the upmarket choice on this beach. Very private. 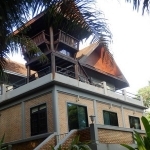 Long established resort in prime position along the southern half of Ao Suan Yai beach with its large selection of bungalows, swimming pool, Taleh restaurant, cafe, ticket office and pier. Still very popular, but is facing stiff competition from its gleaming new neighbour. The small road behind Koh Mak Resort and Seavana Beach Resort heads off across the island via a central hill to the south west beach at Ao Kao or onto the Ao Pra Beach and ultimately Laem Tookata. The central hill is home to a few holiday houses and Islanda Hotel Resort and Thaidaho Vista, all with magnificent views over the bay below and out to Koh Kham in the distance. Islanda Hotel Resort offers rooms from 4,000bt to 8,000bt set around its central swimming pool. 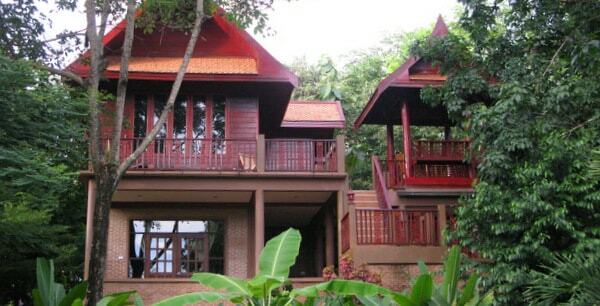 Thaidaho Vista, a friendly guesthouse with cafe starts at 1,500bt up to 2,500bt. Good Time Resort is opposite them, with its accommodation in rooms and vast villas hidden away among the trees in a shaded garden, their Thai tropical house for 2 persons from 2,500bt. On the hill above Ao Suan Yai Beach, 18 rooms and suites, standard and deluxe, swimming pool, restaurant and terrace bar, with amazing views out over the bay towards Koh Kham. A 10 to 15 minute walk to the beach in either direction. Very private and understated, a selling point. On the same hill but facing the other bay of Ao Kao, set in landscaped gardens in the centre, superior and deluxe rooms or huge Thai style wooden villas and 2/3 storey houses, swimming pool and restaurant. 10 minute walk to Ao Kao beach. Peaceful location. Set in the grounds of Good Time Resort, sleeps up to six persons in 3 a/c ensuite bedrooms, fully fitted kitchen, patio & terraces on ground, first & second floors with sun loungers, dining areas. Excellent views, 10 minutes walk to the beach, can use resort swimming pool. Set within the Good Time Resort, three storey villa sleeping 8 with 4 bedrooms, 3 bathrooms, living room and fully fitted kitchen. Terrace, landscaped gardens, short walk to the beach, can use the resort pool. 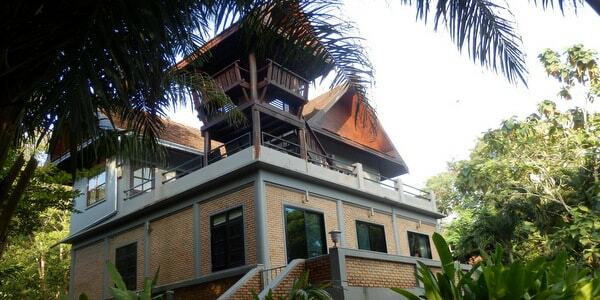 On the hill above Ao Suan Yai, with Islanda Resort Hotel next door, small friendly resort of 5 a/c rooms with single and double beds, guest kitchen or cafe for breakfast, coffee, which is also open to the public. Evening meals available and the whole set-up run by an American Thai couple. 10 minutes walk to Ao Kao beach for a bit more action. Shortly after these resorts on the central hill, another turning drops sharply down to Cococape Resort, which sits all on its own on the headland between Ao Suan Yai and Ao Pra Beach, a bit of a walk back along the rocks to the beach at Ao Suan Yai. Cococape Resort has all manner of themed rooms and villas ranging from 2,000bt to 9,000bt per night in peak season. Koh Mak’s newest luxury boutique resort, Mira Montra Resort, is the only resort on Ao Pra beach itself, about 10 minutes walk along the sand from Cococape. Their deluxe villa is available through booking sites at 4,750bt in peak, their beachfront family villa at 11,000bt. On the cape at the southern end of the beach, large selection of fan and a/c bungalows and villas, even a converted boat, on the seafront and around a tiered swimming pool. Restaurant with western food, boat trips to Koh Pii for excellent snorkelling, walk along to get to the beach proper. Ao Pra Beach next door. New in 2017 luxurious boutique resort on Ao Pra Beach, large selection of deluxe garden villas, beachside villas and family villas on this very quiet and undeveloped beach. All a/c, ensuite, tastefully finished with polished wood floors, rush matt ceilings, designer touches, light and airy. Central restaurant, feature swimming pool. Activities and transfers organised. Motorbike and bicycle rental. Wi-Fi. Located at the northern end of Ao Suan Yai beach, new resort constructed from coconut trees of 10 fan rooms with bathroom attached. Restaurant. Ideally suited for Turtle Beach (Ao Tao Kai) in the far north and for walks on the trails. Quiet, escapist. 3 a/c bungalows and 2 fan rooms in a small grassed area just back from the sand, with their Thai Sabai Bar nearby. 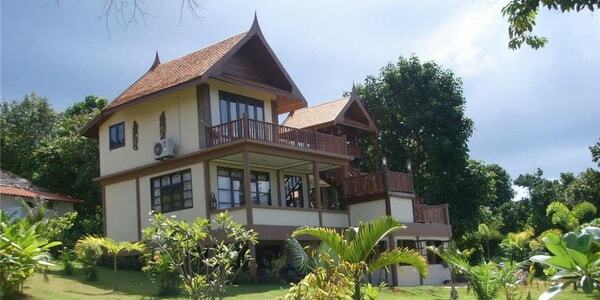 2 minutes walk from Koh Mak Resort and its facilities. Same owners as Pompak Dee offering a handful of simple tents (definitely not glamping) with bamboo wall surrounds for privacy and protection. Communal washing facilities. By the pier on Ao Suan Yai, Koh Mak Resort has its Taleh restaurant and bar and there’s a small ticket office and minimart. The western style Pineapple Cafe sits at the back behind Taleh, with the Thai Sabai Bar, in front of Golden Beach Camping, great for drinks and snacks on the beach. Without transport in Ao Suan Yai, you will probably hang out where you stay and if booking either Koh Mak Resort or Seavana Beach Resort, this would be part of its attraction, peace, quiet and privacy. The walk to Ao Kao Beach is about 15 to 20 minutes. You can find a good minimart on the bend at the start of the large villas of Good Time Resort before you reach Islanda Resort and on the hill down to Ao Kao Beach, Art House offers live music most nights. If you choose the hill for accommodation, it’s an easy walk from there to the restaurant strip on Ao Kao for more dining choices and a bit more action, though do take a torch. Ao Pra Beach is on its own, so if staying at Mira Montra Resort, do note there are no other restaurants or bars nearby. It is walkable at night over to Ao Kao, 15 to 20 minutes or you can use a taxi. After 10.00pm, please note that the taxi charge increases from 50bt to 100bt per person.